Chicken is one of America‘s favorite foods and many different dishes can be created with Chicken! With this collection of Chicken Recipes your sure to find something everyone in your family will like! You‘ll find recipes in here for Casseroles Enchiladas Appetizers Pot Pies and more! I‘ve put together a small sample of just some of the recipes you‘ll find in this ebook. Chicken is a favorite for just about everybody and it‘s low in fat! So grab your copy today of "300 Chicken Recipes" and you can be making mouthwatering meals for your family or friends tonight! This awesome collection will only cost you $5.95! 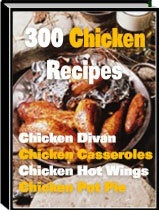 300 Chicken Recipes is delivered in PDF format and is viewable on any computer. All you need is "Adobe Reader" or "Acrobat eBook Reader" which is available free and already on most computers. If you do not have it installed on your computer Please Click here to get the software. They are both Free.